The DKA, Dominique Ansel Bakery, Manhattan | Parlez-Vous Loco? 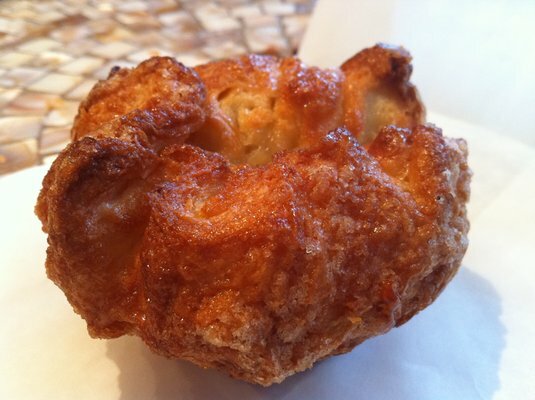 I’m on a little kouign amann bender right now – a memory bender, that is, since I haven’t had any for a few months. You may recall that I just wrote about the mouthwatering kouignettes of Maison George Larnicol last week. And then, lo! I found this, which I wrote for my blog way back in June but never published thanks to the busy days of freelance life. All these months later, I still maintain that the DKA is the BFT in NYC: the Best French Thing in New York City. (Take that, cronut!) Here’s what I wrote back in June. Read on, and then please … go get a DKA. New Yorkers, like people in every other city around the world, love to leave town over a long holiday weekend. This past Memorial Day weekend, guess where at least 200 of those escapist New Yorkers ended up? At Dominique Ansel Bakery, at the exact same time as me, in a line snaked around the block waiting for the infamous cronut. We made it all the way to the door–the next people in!–before we found out that they were sold out of cronuts for the day. Quel dommage and hells bells. We forged ahead anyway, and I’m so glad we did, because that’s the day I discovered the BFT: the Best French Thing in New York. Meet the DKA, AKA Dominique’s Kouign Amann (pronounced kween ahmahn). If you’re not familiar with the KA, the basic stats are this: it’s a sinful, buttery-caramel treat invented by some evil Bretons who apparently didn’t care if their hearts stopped beating, as long as butter and pastry were the cause. (One of many reasons I love France.) It’s similar to a croissant, except a kouign amann has caramelized bits of butter, sugar, and salt that settle between its denser-than-a-croissant layers. And when made properly, it’s kind of a life changer, at least as far as pastries go. I’ve tried a fair amount of French pastries here in New York, and as amazing a food city as it is, my assessment after tasting most of them was that maybe America just doesn’t have the butter to compete with France in the pastry realm. That was before DKA Day (as I’m now calling it), though. This, my friends, is the real buttery deal. It’s a masterpiece. The madeleines they gave us while we waited in line were really good too: light, lemony and hot from the oven. Based on those and the DKA, I’m guessing the cronut lives up to the hype, so it looks like I’ll be standing in line again soon. Maybe in 2015 I’ll actually get to try it. To get an even better sense of the amount of butter we’re talking about, check out this buttery-crisp picture and recipe over at David Lebovitz’s blog. A DKA / Cronut taste test on CNN, hosted by none other than Anthony Bordain. My favorite croissants in Paris, with a shout-out to an amazing kouign amann in the 12th. And of course, those heavenly kouignettes at George Larnicol.